"What is it all about? Nokia Location Tagger is a small application running on “selected” S60 3rd devices that allows you to tag pictures captured from Camera application with geographical coordinates from GPS. The tagging process itself is sometimes called geotagging or geocoding (see also this article at Wikipedia). Technically, the location information is stored in the EXIF header of your pictures (.jpg file)." With Nokia Location Tagger, you can automatically tag your location data to your pictures. As you take a picture, your GPS coordinates are saved to the EXIF header of the JPEG file. You can use this data later, for example, to locate your pictures on a map. In the near future, we hope to make location tagging a seamlessly integrated part of your Nokia experience. Until then, Nokia Location Tagger is a small standalone application that gives you a sneak preview. We are not planning to productize this application as such, but we’d love to hear your thoughts already now, so that we have time to take it into account in the mainstream development. Tested with Nokia N95, N95 8GB, N82, and E90 using the integrated GPS. Should work but not fully tested with all S60 3rd edition devices using an external Bluetooth GPS receiver. Sharing your location-tagged pictures online requires Share Online 3.0. - Launch Nokia Location Tagger application.- On the main screen, you will see the status of your GPS module. It will show the coordinate if GPS module is active. Otherwise, it will show "Searching".- To tag pictures with GPS coordinates, simply use the built-in Camera application. Press the Camera button of your device to take pictures as usual. When Nokia Location Tagger is running in the background, you will see small icon at the top left corner of Camera’s view finder. This indicates the status of GPS module: Green: GPS module is active. Amber: Nokia Location Tagger is connecting to GPS module or searching for GPS coordinate. Red: GPS module is inactive. Q: What happens if I take pictures while the GPS module is not active yet? A: Nokia Location Tagger tries to tag pictures to the last "known" coordinates in the last 10 minutes. Since GPS module normally takes some time to initialize, it’s better to launch Camera application a couple of seconds before taking pictures. Launching Camera application will activate Nokia Location Tagger; which will initialize GPS module. You can also bring Nokia Location Tagger window to the foreground to initialize GPS module. Q: How can I view the GPS coordinates of my pictures?A: The GPS coordinates are stored in the EXIF header of JPEG files. Some online sites, such as Flickr and Panoramio are able to display GPS coordinate from the EXIF. For more info on these services, please see below. You can also use photo organized software that read EXIF, such as Picasa (with the combination of Google Earth). Q: How can I set Flickr to automatically import location in my uploaded pictures, and place them on a map accordingly?A: Please go to this URL: http://www.flickr.com/account/geo/exif, sign in, tick the yes please box and click save. From now on, all new tagged pictures that you upload will automatically be placed on a map. Also underneath every picture, there will be a map link that - after you click on it - shows where the picture is taken. Here are some examples. A nice alternative to Flickr is Panoramio. After uploading your pictures, you can view them on Google Maps but also export them to Google Earth. Here are some examples. issues- The pictures from secondary camera are not tagged. Nokia Location Tagger tags pictures from the main camera only.- In a very rare case, Nokia Location Tagger may not be able to tag picture with the error message "File is being used".- Pictures captured in burst mode may not be displayed in order in the Logs tab.- This version has been tested on N95, N82, E90 as well as N73, N81 with external GPS module (Nokia LD-4W). It should work on all other devices; but there is no guarantee at this point. What can we do with the Geo-tagged pictures? You can upload them to the photo sharing sites, such as Flickr, Panoramio and Picasa Web, so that your friends know where the pictures were taken. If you want to keep them private on your PC, some photo organizer applications, such as Picasa (combined with Google Earth), are able to display location information. Please read the instructions at Nokia Location Tagger web page. "See 280 square miles of London in amazing aerial photography, from Parliament Hill to Dartford, Tooting to Upminster"
Images are very high resolution but concerns over privacy. **The west of London is unavailable because of flight restrictions around Heathrow. New yellow markers indexed to the sidebar help narrow down places of interest. You can also get directions to each one. Lots of 'GIS' going on underneath to do this. Now you can find points of interest and do not need to have an end address/location to get map directions. Driving Directions? But sometimes quicker to walk. Would be handy in large cities to have a 'walk to' option as you can see in Leicester Square you get sent around the one way system. But Leicester Squaree is pedestrian only and would take only a few minutes to walk. If driving you might miss the show. 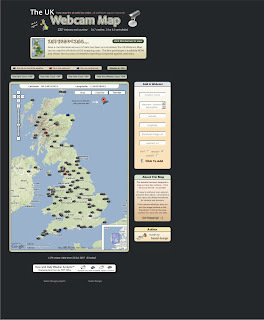 "The map below shows a selection of the sightings that have been recorded. Click on a molehill to find out who spotted what!" "The mole is thought to be one of the most common mammals here in the UK, however there is very little basic information about them and their numbers. With continuing changes to our countryside it is important to monitor species that can be affected by farming methods and the fragmentation of their habitat, before something happens and it is too late to help. Currently there is no detailed map for moles in the UK, so we have decided to carry out MoleWatch, to find out more about these secretive creatures"
"A group of moles is called a labour." This is not intended to show how weather forecasting can be inaccurate, but more to show which areas are served well by a general weather forecast. Maybe a georss overlay from the Met Office? Shame Transport for London (TfL) cannot make use of this. They have the feeds (rss based) now. Why only the South East? It's all down to sources, currently only Travel Line have there data in the correct format for Google to read and be able to map it. It's early days for this in the UK, hopefully National Rail and Transport for London & others start providing this information for third parties such as Google. hopefully this blog gets read by the companies to make it happen. "The incident happened as Prime Minister Gordon Brown was due to leave Heathrow for China and India. His flight was delayed because of the incident. " "All 136 passengers and 16 crew escaped from the British Airways flight BA038 from Beijing. Six people have been taken to hospital with minor injuries. An airport worker told the BBC that the pilot said he had lost all power and had to glide the plane into land. " "MSN today launched its latest online map search in China. Based on Microsoft’s virtual earth platform, the new service will include detailed information on 114 cities in China, including information on the public transit system in 11 cities. MSN China had launched its online map service in China prior to Baidu and Google both launching their own map services." Census information can also be applied and helps locate nearby services. 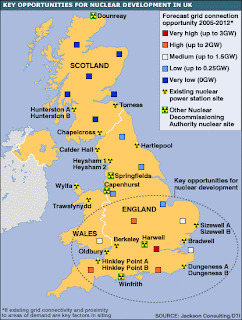 The Mapping Data does vary in places but it is very good to see that this being used and work very well. Where is all this new data coming from? The entire US will be done in: 1499766 seconds or 17 days or 0.047525 years on Monday January 28th at 17:26:08 2008. Also in discussion is the "The licence: where we are, where we’re going"
Mapperz gives full credit to Nestoria and Open Street Map - People outside the UK don't really understand the expense and difficult/complex data licensing that Ordnance Survey produces. *wonder if their government ceramic discs will go missing in the move? To Location Map in Google Maps with link to the Wikipedia for each site. Sam Knows is one of the best independent sites for finding broadband (Phone or Cable) in the United Kingdom. Now their Mapping Application is even easier use. The 'Old' Mapping required both Telephone (BT) Number and Postcode to find out broadband availability. Now you do not need these. 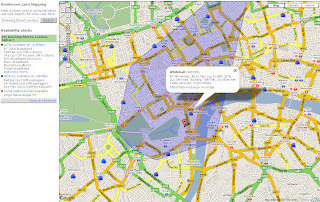 Reverse Geocoding aids the location search for broadband services in any area of the UK. Purple Transparent Polygon shows the approximate area of broadband coverage for a BT Exchange. The mapping system is designed to be as easy to use as possible. If you just want to browse around your area to see what telephone exchanges are nearby and what services they provide, then simply enter the name of your area in the search box and click Search. You can then zoom in, zoom out or move around the map (by clicking and dragging with your mouse). Exchanges will appear as blue buildings on the map and will appear dynamically as you move around. You can click on any exchange to see a summary of the wholesale services at the exchange (e.g. the ADSL, SDSL, LLU and cable services in the area). If you're looking to move home or are just interested in your own area, then the mapping system has something for you too. Click on any road or place on the map to receive useful information including the connected telephone exchange and the distance from it in metres. There's also an option here to perform a broadband availability check. The new mapping engine makes extensive use of the existing database we have and couples it closely with the Google Maps API, which provides the postcode and address lookup functionality. A special thank you goes to Nico for his Reverse Geocoder addon for the Google Maps API (Click here for more). "I added a helper function to search the resulting placemark for a certain property." The exchange coverage polygons are derived from known postcodes served by the exchanges (captured from historical checks performed on the existing availability checker). Sampling well over a million such records and combining it the data with Google's geocoding engine has enabled us to produce the polygons. Note that these are likely to be erroneous in some instances, primarily due to a postcode being incorrectly tagged to an exchange. Such errors will be cleared up over time. Samknows.com is dedicated to tracking the roll-out and progress of broadband across the UK. It was created by Sam Crawford, and is also maintained by Paul Buck and Ian Saunders. 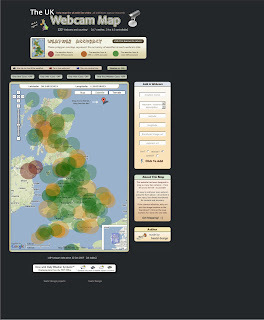 "The site was started as a small hobbyist site after I worked at Datasouth UK on the Hampshire Broadband project. I left there in September 2003 to study for a BSc Hons in Computer Science at the University of Bath. Four years on and I have now graduated with a first-class degree, and will be returning to Canary Wharf this autumn to work as a developer of mobile computing applications." Well done Sam and the Team. Nico Reverse Geocoder was blog about here first. Nice to see that it is getting used in full. "Yahoo! Go 3.0 connects your device to these Yahoo! services in real time. You can manage your contacts on the device and changes are synchronized with your Yahoo! account. The application uses widgets to display information from your Yahoo! services. Download provides a basic set of Yahoo! 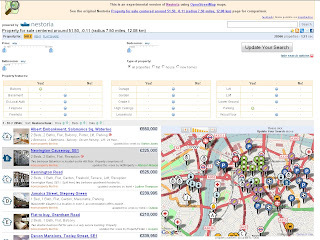 Go 3.0"
Results will vary based on what you search for and the location set. Local & Maps remembers the last location mapped so that you can get the information again immediately. Traffic Watch where you can check traffic incidents for your location and for special routes you define. *Local & Maps is only available in versions for the United States of America currently. If your device has GPS, you can use it with Local & Maps. "The Placemark balloons include information about airlines and destinations. Labels follow Wikipedia’s convention of using place names rather than real airport names. Routes are displayed with exaggerated altitude. " "One downside of Google Earth’s highlight mode is it doesn’t stay switched on a after a mouse click. However, there are a few navigation tricks that allow you to keep routes displayed and move around." Click the middle mouse button on an airport icon, and hold it down while moving the the mouse. Hover the mouse pointer over an icon, then switch to keyboard control (cursor keys, shift + cursor keys, Page up/down, + key, - key, etc…). Click on an airport icon, quickly drag it and let go. Just as you would to set the Earth rotating. "The source data for all this is scraped from the Airport pages on Wikipedia, and compiled using a lot of Perl scripting to scrape, mash and meld it into KML. Obviously its never going to be 100% reliable, but at least it should be pretty easy to keep the file regularly updated, and expand to other parts of the world." Nice use of Wikipages and Google Earth. Added Polyline Azimuth options to “Calculate Geometry” tool. Multiple minor edits to code and manual, described in full in manual. Build 1.1.76 (January 10, 2008) Corrects a bug where the Spheroidal Length was being written to the wrong field. "Description: This extension includes a large suite of tools for calculating geometric attributes of vector features and for selecting and naming graphics. All tools are available at the ArcView license level." Simple layout of functions - much better than those geoprocessing tools in the toolbox you can never find the name for. the world, including a long-term contract with the United Nations Food and Agriculture Organization (FAO) for which he relocated to Rome, Italy for 3 months. His free ArcView tools have been downloaded from his website and the ESRI ArcScripts site over 190,000 times." Jenness, J. 2008. Tools for Graphics and Shapes: Extension for ArcGIS. Jenness Enterprises.